How might you characterize the shapes of these stones? 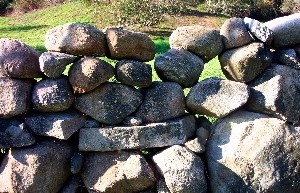 Stone walls are rich objects from a mathematical perspective. There are three dominant scales. Map & Field: In map view, or that of an overlook, stone walls are polygons dominated by lines, junctions, and angles. Wall: Standing in front of one, each wall is a discrete 3-D object. Let X be the length of the wall, Z be its width, and Z the vertical direction. Most well-built walls will have the same shape in cross section (Y,Z). Stone: Each stone in the face of a wall has a size and shape. Consider them to be a collection of objects with different traits: size, shape, composition, etc. The situation demands measurement, estimates and statistics. Geometry: The trace of a wall in map & field view is a vector, consisting of direction and length. These walls intersect at various angles. When a field has walls on all sides, it becomes a polygon. The shape of the wall and the shape of the stone are geometric objects as well. Statistical properties: Consider the wall as a collection of stones. The statistical properties of this collection can be easily measured and described. The same is true for other aspects of walls in the local area (i.e. how many walls, rather than how many stones). Measurement: Any length or perimeter can be measured by individual student teams. Their results can be compared and interpreted. Estimation: An actual count of the number of stones in a wall’s face can be compared with an estimate made from a small section. pre-Algebra: The slope of a wall, expressed as rise over run, can be used to help introduce the idea of variables, factors, and elementary trigonometry. Proportions of wall: length, width, and height. Proportions of individual stones: length, width, thickness. Compass bearing of line of wall (azimuth). Face angle of wall relative to horizontal (usually between 50-90 degrees). Slope of the land in different directions. Shape of walls and stones: rectangles, trapezoids, triangles, etc. 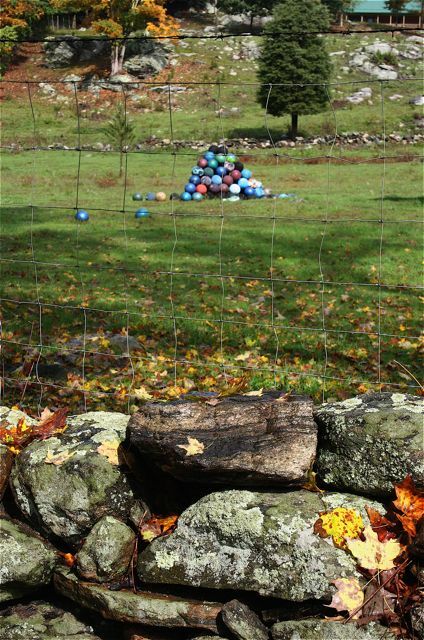 Terminology for measuring stone walls can be found on this website , which was taken from Exploring Stone Walls: A Field Guide to New England’s Stone Walls. Spatially, how do stones stack differently from spheres? See bowling balls in background.